The epitome of relaxed, upright, Dutch-style cycling. Ride to the store, the beach, into town, to school or wherever you want. No need for special bike clothes – wear whatever you are comfortable in. This bike is the full package: Unisex step-thu frame with front and rear mudguards, rear pannier rack, chainguard, dynamo hub that powers the front and rear lights, kickstand and wheel lock. Nothing more to buy, just get on and ride. 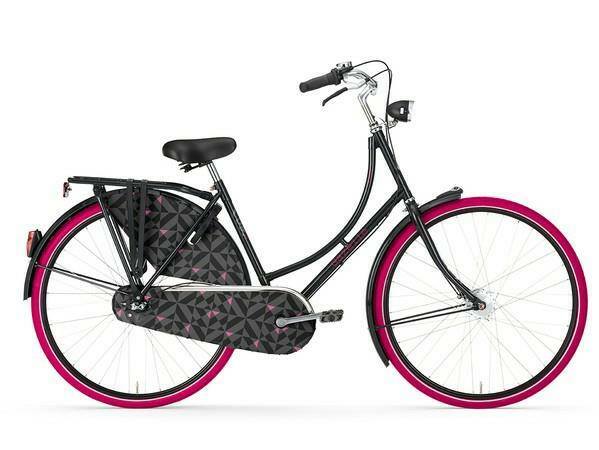 Just one left: Black frame with pink tyres. They’ll see you rolling! Original price $1,119.95 – now on sale for $999.95.